Dove claims that only four percent of women worldwide consider themselves to be beautiful. To counteract this, Dove has been running a “Real Beauty” campaign featuring real women showing their true, natural beauty. The tagline of the campaign – “You are more beautiful than you think” – is aimed directly at countering the misperception by many women that unless they can live up to an idealized super-model image, they are less than beautiful. The video begins by having women describe themselves to a FBI-trained forensic artist, who then draws their portraits according to their own descriptions; the artist never sees the women, only uses her words to complete the drawing. This is followed by having these same women sketched according to descriptions given by someone who just met her for the first time that day. The difference between the two drawings is significant, as is the real emotion expressed by the women who see then see their real beauty through the eyes of strangers. It’s a moving campaign that brings women to reconsider their true beauty and essence, making women wonder if they judge themselves too harshly. 1. There are a number of videos that have been produced by Dove about the topic of real beauty for women. View these to help put the “real beauty” campaign into a larger context being used by the company.http://youtu.be/litXW91UauEhttp://youtu.be/m0JF4QxPpvMhttp://youtu.be/lg_jbSP-F2o2. What are the key messages from these videos? Who is Dove’s target market? How effective do students think these videos are in the marketplace? 3. 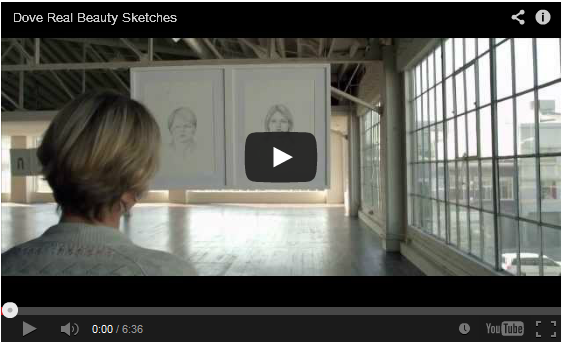 Show video where women describe themselves and are drawn by a forensic artist. Then others describe the women to the artist – and a very different person emerges: http://youtu.be/XpaOjMXyJGk (Note: this video went viral in a matter of days and quickly amassed more than 54,000,000 views. 4. Finally – to get students laughing, show the parody video where men describe themselves, and then are described by women: http://youtu.be/T8Jiwo3u6Vo5. Student teams: Could this approach be used by other beauty products?